I demand organic. It's that simple. I know, you're thinking, "Of course you demand organic. You wrote the Organic Manifesto and grew up on an organic farm." True, but, even if I didn't, I would demand organic and so should you. In lieu of giving you my big speech about how organics can feed the planet and make us safer, I will focus on one very good reason why I demand organic: GMOs. Genetically Modified Organisms, or, as the FDA says, foods that have undergone genetic modification, meaning they've been engineered and altered at the genetic level "using any technique, new or traditional." Choosing organic is the only way, right now, that I can make sure I am not feeding my family potentially dangerous biotech ingredients. And although the food manufacturers have done a tobacco-industry-worthy job of trying to convince us that GMOs are safe, the truth is that the science is starting to say otherwise. So far, there's only been one published study on how GMO ingredients affect us when we eat them. It was in the journal Nature Biotechnology, and it found that after we eat GMO soy, some of the GMO genes are transferred to the microflora of our intestines and those GMO genes are still active. Another study, published in Reproductive Toxicology, found Bt-toxin (used in genetically modified Bt corn) in the blood of 93 percent of the pregnant women studied and their babies. The study authors suggest that aside from eating products made from GMO crops, eating meat from animals fed GMO crops may lead to a "a high risk of exposure." Finally, an Italian study published in The Journal of Agricultural and Food Chemistry found that in young and older mice fed Bt corn, there were changes to their immune systems that corresponded with allergic and inflammatory responses. In humans these same inflammatory changes are associated with arthritis, inflammatory bowel disease, allergies, and autoimmune diseases. So here are three studies: One reports that GMOs survive in our bodies -- they aren't killed in the stomach, as some have suggested, but travel to the intestine where they remain active in the body. Another study reports that we are exposed to these GMOs, not only from the GMO foods themselves, but also from eating animals that eat GMO foods. And finally, animal studies reveal that these GMOs may be linked to disease. So I say, Just Label It! 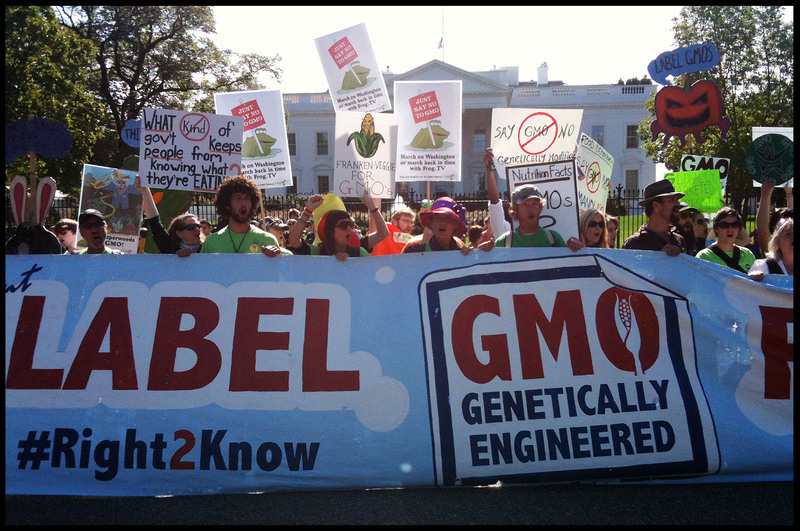 Right now there is a grassroots effort underway to mandate the FDA to label GMO foods. 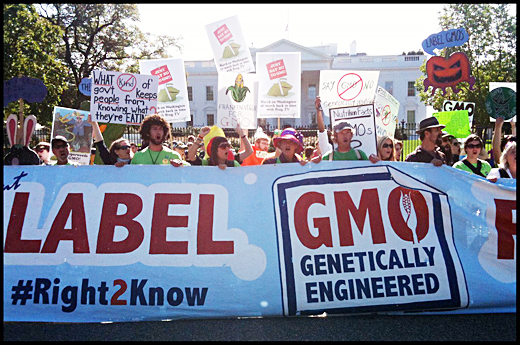 In October, The Just Label It: We Have a Right to Know campaign filed a petition with the Food and Drug Administration (FDA) to require mandatory labeling of GMO foods. It is supported by more than 450 businesses and organizations dedicated to food safety and consumer rights and more than 400,000 people have already raised their voices to tell the FDA we have the right to know what is in our food. If there's nothing for us to worry about, then seed and chemical companies should freely allow studies to be done so that food companies can confidently label their products. Show us the science saying that there's nothing to worry about, and then label products, proudly: "Made Using Biotechnology." (Hmmm, "M.U.B" -- well, I'm sure their PR teams would come up with something catchier.) But the point is, show us the real science behind the safety claims, and then put your money where your mouth is. Although, according to a study in the journal Food Policy, studies that "cast genetically modified products in a favorable light" often have authors with either financial or professional ties to industry. So perhaps their mouths are already full. Don't get me wrong; I don't blame the scientists. The problem is that most scientists are blocked from doing the non-biased work they need to do because seed companies will not fund or give permission for research unless they have the right to control what gets published. Which means that studies that cast an unfavorable light never see the light. We need transparency! Again, I say Just Label It! It seems like a simple solution, but manufacturers have decided that, if given the choice, we the consumers might not choose to buy GMO products. So, they've decided not to give us a choice, which doesn't seem very American. And the FDA says they have "no basis for concluding that bioengineered foods differ from other foods in any meaningful or uniform way, or that, as a class, foods developed by the new techniques present any different or greater safety concern than foods developed by traditional plant breeding." Maybe I should send them some of those studies, in case they missed them. Or maybe they should use some of the government money that is currently being spent to subsidize GMO crops to fund non-biased research that benefits the American people. Demand Organic! GMOs are banned in organic farming and in organic food, although as the U.S. Department of Agriculture approves more genetically engineered crops, the risk of cross-contamination through pollen increases. Sign the Just Label It petition. Having choices in the marketplace is something that Americans take pride in, but that right is stripped of you every time you set foot in a grocery store because GMOs aren't required to be labeled. Ask the FDA to change that policy. Know the Usual Suspects. Corn, soy, cotton, canola, and sugar (in nonorganic form) are the five ingredients most likely to be genetically engineered. Eighty percent of the packaged foods in the U.S. contain GMOs. If you can't buy organic, then look for the Non-GMO Project Verified seal. The group tests for GMOs, but not for pesticide residues. Spread the Word. The best solution is education. The more people who know about the hazards of GMOs, the less people will want to consume them. And voting with our dollars is one of the most powerful ways to send the message: We demand the right to know what is in our food! Share this message with as many people as you can so that companies hear us loud and clear.